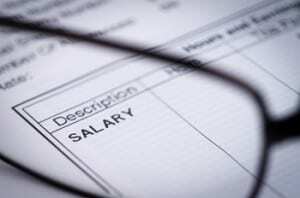 IRS Wage Garnishment: How Much Can They Take? Only the “exempt” amount limits what the IRS can garnish (levy) from a taxpayer’s paycheck. The taxpayer’s employer sends all wages above the “exempt” amount to the IRS. The taxpayer then keeps this “exempt” amount. The IRS sends form 668-W and publication 1494 to the taxpayer’s employer. The employer fills out the form 668-W according to information supplied by the taxpayer. The employer uses this information to select the “exempt” amount from the tables in publication 1494. To arrive at the correct amount, the employer asks for tax information from the taxpayer. Previous year tax return filing status, number of exemptions and salary frequency are all used to decide the “exempt” amount. The taxpayer has three days to provide this information to the employer. If not provided in time, the IRS assumes a taxpayer filing status of married filing separately with one exemption. This often results in a lower “exempt” amount. For example, assume a taxpayer’s true filing status is married-filing-jointly, has three exemptions and a $1,000 weekly salary. The 2012 IRS publication 1494 tables show an “exempt” amount of $448.08. The employer sends the $551.92 weekly balance to the IRS. If the taxpayer does not present timely information the IRS then assumes a much lower “exempt” amount of $187.50. The lower “exempt” amount obviously causes more pain. Garnished wages fully pay off the tax debt. A wage garnishment release (wage levy release) is obtained after the taxpayer reaches a settlement with the IRS. How much can the IRS garnish from wages? Respond quickly to the IRS levy notice. Fill out the form and return it to the suggested IRS address. If the taxpayer fails to meet the three day deadline, the IRS allows only one exemption for calculating the levy amount. Make certain the IRS is not levying more than the guideline amount. The taxpayer can verify this by checking IRS Publication 1494: “Tables for Figuring Amount Exempt For Levy on Wages, Salary and Other Income”. The IRS updates the amounts in this publication yearly. If the taxpayer is experiencing genuine hardship, contact the IRS immediately to get the garnishment lifted or reduced. Please refer to blog post “How To Qualify For IRS Hardship Status“. The taxpayer should consider other tactics if they do not qualify for IRS hardship status. These would include strategies like the installment agreement and the offer in compromise program. It is advisable the taxpayer seek the advice of a tax problem specialist.